Who doesn’t love their hot water bottle? 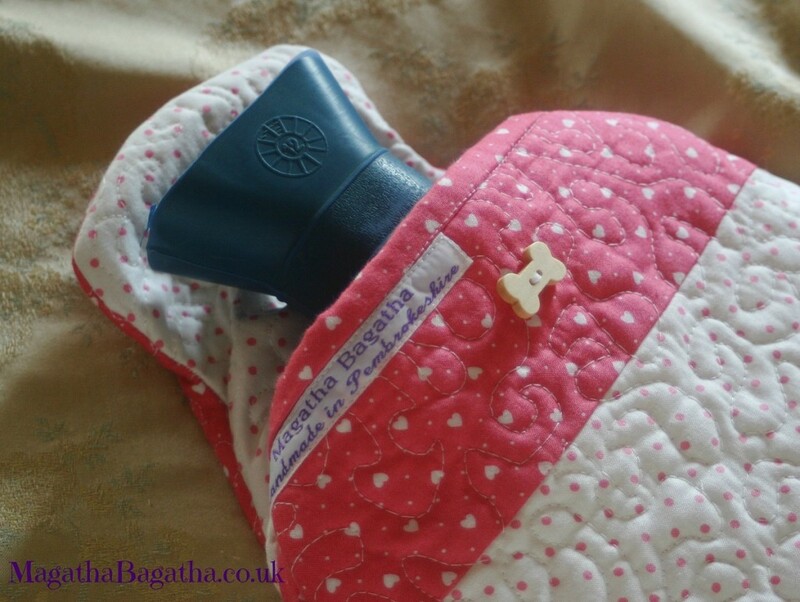 It’s so very comforting to get into bed with something warm to cuddle – ideal for back or shoulder pain, or just to take the chill off your cotton sheets. I have just added four dachshund-themed hot water bottle covers to my online shop, so I thought I’d share their history with you. We’ve all got hot water bottles here and I was unhappy with the cover mine came with; it was a bit loose and baggy and the button had come off, so at night I was in danger of scalding tender skin on hot bottle. So I applied my quilter’s brain to the problem, drew around my bottle, came up with an envelope-style pattern and the rest is history. I particularly wanted my design to have a good overlap so there’s no danger of contact between skin and bottle. There’s a lovely big space on the front for all kinds of appliqued designs and the three part pattern lets me have fun with different fabrics too. I wanted my hot water bottle cover design to have a snug fit and a good overlap. Of course, having made one for myself, everybody wanted one, so I had to make three more. I was on a roll then, and they are fun to make so I added them to my website. The cover is basically a quilt sandwich – outer layer of cotton fabric, then a layer of cotton/polyester wadding and finally a soft calico cotton lining. I quilt these together using my favourite swirly pattern, often using a variegated thread, bind the exposed edges, sew them together and finally add a button. At the moment I’m rather fond of my dachshund design, but I’ve done penguins, owls and monograms in the past. Perhaps the future holds Pembrokeshire corgis or bunting… or something else! 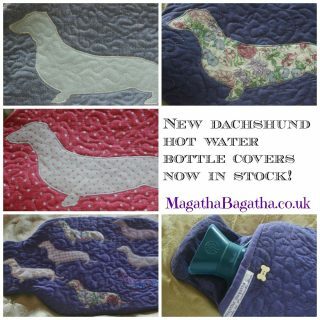 What would you like on your hot water bottle cover? Let me know!